Global nations who are chosen to host international events, especially the International Olympics, not only attract global attention, gain international renown and of course, profits, but also come under critical worldwide scrutiny. The prevalent barbaric treatment of animals will not escape this scrutiny. Many countries who will participate in the Olympics have animal welfare laws with strict enforcement of violations, and most certainly, the illegal dog and cat meat industry will create a global outcry against the treatment of companion animals and the appalling fact that these animals are actually farmed for human consumption, and live their short lives in inhuman conditions, not to mention the horrific ways they are slaughtered. The 2018 PyeongChang Winter Olympics is just around the corner and this is the perfect time to ask the International Olympic Committee (IOC) to urge South Korea to stop the brutal torture and killing of creatures, known universally as companion animals, by ending the horrendously cruel dog and cat-meat trades, not only for the duration of the Olympics, but permanently. Make a call, send a quick online message and a postal letter to the IOC asking for their moral and ethical consideration in helping to end the dog and cat meat trade in South Korea. Danish: Skriv til Den Internationale Olympiske Komité. Dutch: Schrijf aan het Internationale Olympisch Comité. German: Bitte schreiben Sie an das Internationale Olympische Komitee. Greek: Επικοινωνία με τη Διεθνή Ολυμπιακή Επιτροπή. Italian: Scrivi al Comitato Olimpico Internazionale. Spanish: Por favor escriba al Comité Olímpico. Make the call to the IOC. Send a copy of your postal letter to the PyeongChang 2018 Olympic Organizing Committee. Make the call to the PyeongChang 2018 Organizing Committee. I am calling to ask for your Committee’s help, in regard to the upcoming PyeongChang Olympic events being held in South Korea, in 2018, which will take place despite the horrendous animal cruelty that will carry on around that country, in all areas of the aberrant dog and cat meat trades; trades which the South Korean Government turns a blind eye to. Please, for moral and ethical reasons, will you contact your South Korean counterparts and denounce these trades, and urge action by their Government to put an end to dog and cat meat consumption before the 2018 games, and to ensure it is a permanent end. May I speak directly to a member of the International Olympic Committee? My name is ________ and I am calling you from (country) because it is very important for me to convey my thoughts to the International Olympic Committee about the host country of the upcoming 2018 Winter Olympics, South Korea. In your response to our campaign against the dog and cat meat trade in South Korea, you replied that sports events were your only concern, and not the practices of the country chosen to host this international event. The athletes participating in the Olympics are representatives/ambassadors of their country. To ignore the hideous cruelties against companion animals in the hosting country, would be an acceptance through silence. Are the participating countries in the 2018 Olympics in South Korea aware that these atrocities are being committed by the Olympics host country? I think not. One action, through formal correspondence to the South Korean government by the Olympic Committee, stating the vehement disapproval of the dog meat industry, may contribute to the end of the dog and cat meat trade. Please do your part, which may help save millions of dogs and cats in South Korea. The International Olympics is an ancient event, which brings together the countries of the world in brotherhood and humanity. Please demonstrate this humanity. Thank you. P.S. Please see the online petition in progress: Boycott PyeongChang 2018 Winter Olympics in South Korea, A Dog Eating Nation! https://www.change.org/p/boycott-pyeongchang-2018-winter-olympics-in-south-korea-a-dog-eating-nation 214K signatures collected as of 10/4/2017. Je partage les mêmes sentiments d’horreur !!!!!!! IL FAUT BOYCOTTER LES JEUX DE PYEONG CHANG 2018. Il faut condamner absolument la sordide cruauté que les coréens exercent sur ces ces malheureux animaux. C’est INDIGNE !!!!!!!!!! Comment a-t-on pu donner les J.O. à de tels barbares ????? Evil, sadistic, barbaric country! No place for them in a civilized world! The Korean people have to wake up to the new world, a new era where animals are considered living breathing, feeling creatures as we are. The unspeakable horrors from birth and especially at time of death has no place in a forward and progressive society. About this adrenelin business, stop making pathetic excuses for torture, the food is spicy, some innocent visitors end up eating dog meat without realizing it because it is so douced with spicies. Many Koreans are against this but their government and the murderers just don’t listen, they even take pleasure from such horrific cruelty, that’s what it has come down to. There should be an international boycott put in place to help them wake up to the reality that this is wrong. In fact they already know this, so persisting with such cruelty is nothing short of criminal. This is so cruel it needs to be stopped right now, these poor animals are subjected to the Most unbelievable cruelty, please stop this, AND NOW . I am extremely distressed about the torture and consumption of animal companions in South Korea. Despite the government’s Animal Protection Law, dogs are still electrocuted, hanged, and beaten to death by farmers and butchers. Dogs and cats to this day are tortured and boiled alive for so-called elixirs, which have no legitimate medicinal properties, but are believed by gullible consumers to increase male stamina, and improve one’s health. Until South Korea ends this appalling cruelty, the country’s reputation in the international community will continue to suffer. Its citizens will face shame and embarrassment. South Korea will continue to be regarded as “third world,” despite its glittering modernization and attempts at globalized thinking. There will undoubtedly be worldwide attempts to boycott the 2018 Pyeongchang Winter Olympics unless the cruel treatment, abuse, killing, and mindless consumption of our beloved companion animals finally comes to an end. Mary, please post your comment on the IOC’s page. Here you’re preaching only to the “choir”. Mary C, Please post your comment or send it to the Olympic organizers and their President Thomas Bach. Korea is a country of shame, the president is an evil and shameful man. It is an embarrassment. Mary, you are so spot on. I fell in love with the country upon countless visits but when I learned of this appalling industry, I am sick to my stomach and won’t even consider going back nor recommending it to anyone to visit. I view this country as backwards and vile. I was born there and have family there and I’m ashamed. Unthinkable cruelty. I have no respect for this Country. We need to boycot sponsers for the olypics in Korea so they know how hanus this brutality is. “When will South Korea finally STOP the criminal, cruel dog and cat meat trade? 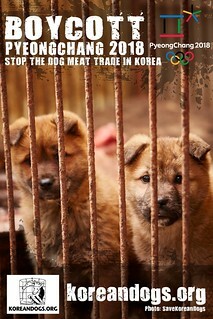 Animal lovers all over the world will be boycotting South Korea (and your Olympics) until Korea does the right thing. The IOC will be irresponsibly remiss if it refuses to put pressure on the Koreans to take action on this internationally notorious and vile trade. The Olympics are a political event too, and you know it. It reflects badly on the Games when the host nation indulges in atrocities on beloved pets while pretending that nothing untoward is happening. And already angry citizens are ESPECIALLY outraged when happy-happy Olympic P.R. bullshitters try and sweep these known facts under the rug. korea or china vietnam How cruel humans killing a dogs or cats for food should not held in the olympic. Accordingly to Ancient Greeks who were the founders of the Olympic Games, they did not carter to eating Dogs or Cats…In-fact the Dogs were highly prized and the cats were honored. If the Olympic Committee follow the traditions of the Greeks then they maintain the ideals of the GREEKS otherwise you would be SHAMING such venue and cannot be consider a OLYMPIC IDEALS. PLEASE STOP THIS BARBARIC ACT! STOP THE KILLING OF INNOCENT DOGS AND CATS WHICH ARE SOME HOUSE PETS STOLEN!!!! by Tv and Merchandising ,instead of carrying a legacy of culture and peace to that country. The President of the IOC is a coward !!!!! wie Menschen!!!! Widerliches, stinkendes Drecksgerotz!!!!! Menschenmüll!!! Verreckt, ihr dreckigen Arschlöcher! Quanta crudeltà su delle povere creature che non lo meritano affatto…se solo imparaste a conoscerli, potreste imparare molto da loro…per esempio potreste imparare ad amare, cosa di cui voi musi gialli siete incapaci!!! Please make this stop. The torture and abuse of our companion animals is not acceptable. Torturing another living souls is evil! This is totally heartbreaking. Action needs to be taken to help those without a voice. Stop , jeszcze raz STOP ! Horrific! How could you do this to man’s best friend? I pray to my Lord Jesus for this to stop and for the cold hearts to be warmed with compassion for all the living, amen. I’m quite agree whit you. This cruelty must Immediately stoped! NE FERMER PAS L OEIL SUR CE QU IL SE PASSE TOUS LES JOURS EN ASIE. CECI EST UN MASSACRES C EST UNE EXTERMINATION DES CHIENS ET CHATS EN ASIE DE L EST. CES GENS ONT UNE HAINE ABSOLUE ENVERS CES PAUVRES BETES. AVANT QU ILS MEURENT ONT LEURS INFLIGENT DE TELLES ATROCITES QU ILS SOUFFRENT HORRIBLEMENT … VOUS NE POUVEZ PAS FAIRE COMME SI DE RIEN N ÉTAIS OU BIEN ALORS C EST QUE VOUS N AVEZ RIEN DE DIFFERENTS DE CES MONSTRES VOUS SEREZ QUASIMENT AUX MEMES NIVEAU.. The suffering that these poor animals are forced to endure is a fate no living being should have to experience, and this fateful torture has got to stop! Those who commit cruel acts to animals, need to be accountable, and punished for these crimes! Animals were Never Meant, to be treated so badly as they are! YOU PEOPLE NEED TO GET ON THE BALL, AND PUT A STOP TO ALL OF THIS OR HAVE ALL THOSE MEAN & HATEFULL THROWN IN JAIL FOR THE REST OF THEIR ROTTEN LIVES. BACK HERE IN THE USA , WE ALL ARE DOG LOVERS. DON’T LET THEM KILL ANY MORE OF OUR LOVELY & SWEET DOGS & PUPPY. GET OFF YOUR DUFF AND DO SOMETHNG NOW. You have power and a voice. The abused dogs and cats do not. Please show some humanity and help. Stop cruel & unethical dog, cat-meat trades. These absurd meat trades, which allow use of unregulated drugs & food, uncontrolled emissions of polluted waste from dog & cat farms & torture & killing of animals for consumption MUST be STOPPED. The torturous suffering these animals undergo is beyond the pale – NO rational, modern, compassionate society would EVER allow such sadistic horror on our fellow living beings. Morality dictates to NOT tolerate this – we should NOT allow any peoples to get away with this heinous crime of animal abuse & death (to the extreme). You state, “Sport presents broad … to promote…far-reaching actions for environmental, social & economic development …”. We ask, how can these horrific killings & practices be allowed to continue in Korea? Does not a lasting change for environment need to stretch beyond the sporting arena? And, what sort of effect does this brutal cruelty have on Korean people, not to mention the rest of the world? IOC Members, I urge you, in the name of rationality, compassion, morality, doing what is right, for the good of the Korean people AND the rest of our world’s nations, we ask you to look for ways to address these concerns thru your partnership between PyeongChang 2018 & the Ministry of Ed. AND thru the IOC’s position of “being a catalyst for lasting change”. CHINA AND KOREA MUST HAVE GENES FROM DEMONS … ONLY DEMONS COULD THINK OF THIS. WE MUST SHAME THEM, TAKE THE OLYMPICS AWAY, BOYCOTT, DO EVERYTHING POSSIBLE TO LET THEM FEEL THE PRESSURE OF THE WORLD. The S. Korean government does NOTHING to stop the horrendously cruel & unethical dog / cat-meat trades — These absurd meat trades, which allow use of unregulated drugs & food, uncontrolled emissions of polluted waste from dog & cat farms, and torture & killing of the animals for consumption MUST be STOPPED. — Understand this — the torturous suffering these animals undergo is beyond the pale — NO rational, modern, compassionate society would EVER allow such sadistic horror on our fellow living beings. Morality dictates to NOT tolerate this — we should NOT allow any people, any country, to get away with this heinous crime of animal abuse and death (to the extreme). Horrific suffering! Where is the humanity! Korea shame on you! You are an inferior power as long as you practice such abuse! Barbarians! Stop cruel & unethical dog and cat-meat trades in S. Korea — NO rational, respectable, decent, modern, compassionate society would EVER allow such sadistic horror on living beings. Morality dictates to NOT tolerate this — we should NOT allow any people, any country, to get away with this heinous crime of animal torture, abuse and death. ARRÊTONS LA TORTURE ! Honte à tous les pays asiatiques qui font souffrir les animaux. Je n’irais jamais les visiter ou achetez leurs produits, Samsung, Kia, LG, pour ne nommer que ceux-là ! Informez-vous de la provenance des produits que vous achetez ! CON CHE CORAGGIO FATE TUTTO QUESTO MALE E ORRORE ALLE CREATURE DI DIO CHE HANNO RICEVUTO LA VITA PER GODERE DEL MONDO COME TUTTI, NON PERCHE GLIELA TOGLIATE VOI…. Expose shocking shameful sadistic barbarity in South Korea and China on many news papers with large circulation. Get on talk show. call tv stations and let millions of people to see gruesome heart breaking dogs and cats meat reality. Dogs and cats in South Korea and China need ACTION! I am sick of those mentally deranged sadists. We need to unite and boycott Olympic. Nobody wants to watch Olympic in primitive sadistic country. Email was sent and letters are ready to be mailed. This evil and barbaric act has to stop …….this is not culture , is pure evil . This evil act of torture & abuse to these innocent pets, is NOT ACCEPTABLE! These barbaric, ignorant, sick, people of these countries are not fit to be part of a civilized world. We would all be better off without them, they only show evil, hate & torture with NO RESPECT FOR LIFE! Please boycott these countries! PLEASE!! I can’t believe you r eating the man best friend these dogs r loyal inteligente they deserve to live you and I , stop this horror now ! Ces nations asiatiques ne sont pas des humains mais des bêtes malfaisantes inférieures à nos amis les animaux, comment peuvent-ils en plus leur infliger des souffrances . Le monde est malfaisant, est-il normal de manger un être vivant?. Est-il normal de laisser faire des sadiques dans les abattoirs?. Your demons! This hell! Stop it! Theyre innocent! One day i hope Satan brings you alll down with him. You should feel their crys! I hope this ends. You all make me sick! Cessez toutes ces tortures que vous infligez à ces pauvres animaux qui sont pour nous nos meilleurs amis, confidents, nos soutiens dans les moments difficiles! Prenez un chat ou un chien avec vous pendant 6 mois, vous verrez tout l’amour et le respect qu’il donne tout les jours! SVP stoppez tout cela! hi i just wanted to let u know that the website , IOC doesnt let more than 100 characters in the comment section. I REALLY HATE ALL THESE MEN IN SOUTH KOREA. THEY DON’T REALLY CARE WHAT KIND OF JOB THEY HAVE, JUST SO THEY GET PAID FOR WHAT KIND OF JOB THEY ARE DOING.WHICH MEANS THEY COULD CARE LESS ABOUT ANIMALS. I SAY THROW ALL THESE BAD MEN WHO KILL ALL THESE DOGS & CATS, THROW ALL THESE BAD MEN, IN JAIL FOR THE REST OF THEIR LIVES. AND FRANKLY I DON’T REALLY WHAT HAPPENS TO ALL THESE BAD MEN. LET THEM ALL ALL ROT IN JAIL FOR THEIR CRIMES.THESE BAD MEN DON’T DRESERVE TO LIVE. Sono certo che in Corea non tutti sono insensibili al dolore di questi poveri animali. Per questo motivo mi auguro, con tutto il cuore, che i coreani sensibili impieghino tutta la loro forza per convincere i loro politici e amministratori locali a mettere fine a questi orrori, al fine di poter credere che anche la Corea è un paese che pensa al bene di tutti, compresi gli animali, cani, gatti, ecc. Basta con le sofferenze a cani e gatti e con il consumo delle loro carni in Sud Corea. vreselijk dit moet stoppen, de hond is de mens beste vriend!! vreselijk dit moet stoppen de hond is de mens beste vriend!!! Regarding to the IOC response on this matter, there are indeed other organizations. That does not excuse the IOC in doing the right thing and acting like an organization that is part of the global community.. Stop organizing the Olympic Games in countries that have questionable human rights and animal rights practices. There is nothing controversial about that.